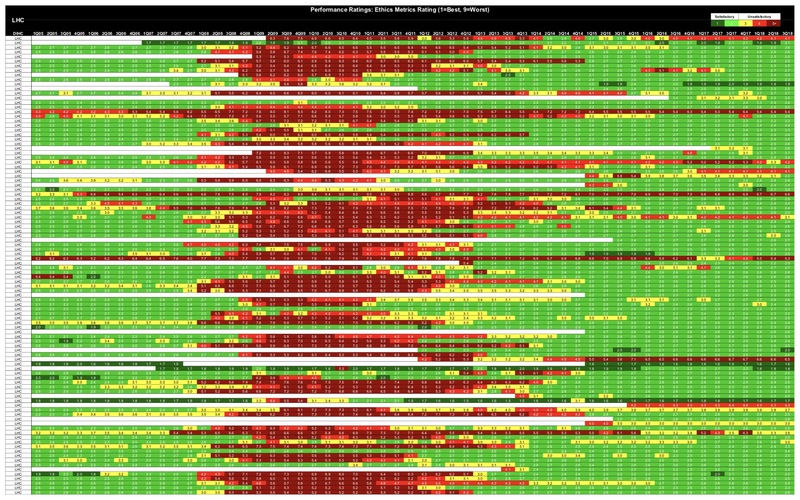 SystemicRiskDashboard.com is a service of Ethics Metrics LLC that identifies risks to the financial stability of the United States that could arise from the danger of default or default, and potential systemic risk, of approximately 100 large, interconnected depository institution holding companies (DIHCs), Covered LHCs, and potential equity contagion risk for over 1,100 global equity investors in the large U.S. DIHCs. Systemic Risk: DFA Section 203(c)(4), as codified in 12 U.S.C. § 5383(c)(4), defines danger of default or default as one of two sets of co-equal and independent systemic risk triggers. Trigger #1 is comprised of (A), (B) and (C) below. The most commonly known element is (B) as this is the focus of capital adequacy stress tests. Notice that the capital adequacy stress tests are evaluating two key elements of the CAMELS Rating system, i.e., Earnings or Losses that deplete Capital. Trigger #2 is (D). This covers Liquidity risks, which is another key element of the CAMELS Rating System. Capital Adequacy Stress Test Results: The potential systemic risks of (B), for 35 DIHCs with total assets above $50 billion, are analyzed by the Federal Reserve’s Stress Tests. The most recent results, as of June 21, 2018, are available here. Half-truths on Potential Systemic Risks: Analyzing and disclosing the results of the capital adequacy stress tests omits an analysis on the other co-equal trigger for systemic risk, i.e., liquidity risks. The narrative on capital adequacy stress tests is only telling half of the whole truth as it relates to one of the two, co-equal of triggers for systemic risk. Telling part of the truth obligates the party to tell the whole truth under common law. 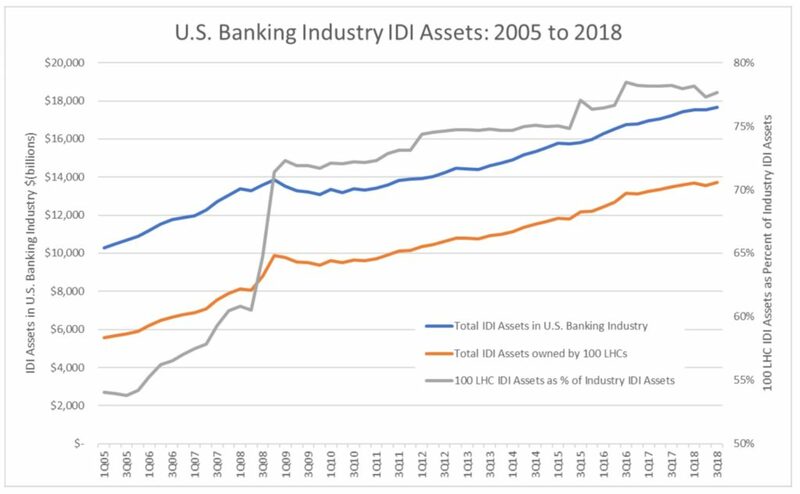 Telling part of the story or half-truths misleads all DIHC investors and stakeholders on the full scope of the defined factors that cause systemic risk. 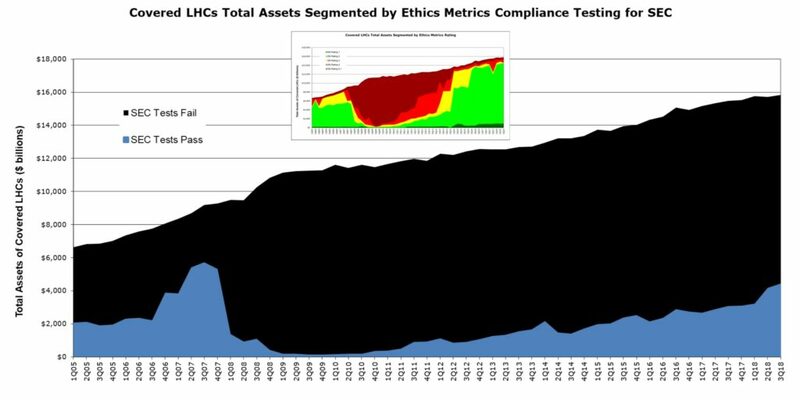 Ethics Metrics’ Methodology: The risk profiles of 112 DIHCs that disclosed formal enforcement actions (FEAs) on unsafe or unsound practices during 2002 to 2017, provide a full lifecycle of CAMELS Ratings data. The levels of compliance range from safety and soundness to unsafe or unsound practices, including default or in danger of default and bankruptcy. The profiles of CAMELS ratings are translated into private Ethics Metrics’ Risk Ratings. The Risk Ratings for the 112 DIHCs closely correspond with the issuance and termination of FEAs, validating Ethics Metrics’ ability to detect levels of non-compliance which have resulted in FEAs over the past 15 years. Ethics Metrics’ Risk Ratings have been reviewed and refined with assistance from bank regulators. Consolidated Data: The data for Charts 2 – 9 comes from individual DIHC Reports, by Ethics Metrics, for each of the 100 currently active, large DIHCs (LHCs). SEC compliance tests evaluate intentional concealment of 3 material compliance violations as confidential supervisory information. These include: (1) formal enforcement actions on unsafe or unsound practices, relating to financial condition and management risks; (2) loss of Well Managed supervisory rating due to compliance violations. Loss of Well Managed status triggers loss of Financial Holding company status, which is also not disclosed. (3) internal fraud and ineffective internal control over financial reporting (ICFR). This is concealed as part of calculating risk weighted assets for operational risks. Paid Subscriptions: Information about paid subscriptions to the portfolio of ~100 DIHC Reports for qualified parties that include RIAs, DIHCs and regulators, is available by contacting Ethics Metrics.